Congratulations class of 2018! Commencement is over and you are on to whatever comes next. 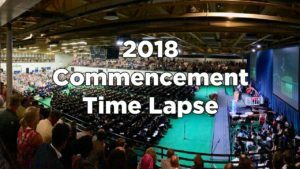 Unfortunately the weather didn’t cooperate this year and commencement was held indoors for the first time since 2014. But don’t worry, there is a camera in the arena that we used to create a time lapse video of the indoor ceremony. Relive the entire event in just under 3 minutes with this time lapse video of the setup, ceremony, and cleanup.